Dimension seems to be all the rage with greeting cards these days. But, with embellishments come thickness and weight. When the postal rates went up a few months ago, so did the strictness about "lumpy" mail. Though the USPS website uses the example of a "pen" in the envelope as too lumpy, the local post office personnel are taking dimension too far and insisting that anything that can be felt through the envelope is too dimensional. This costs 17 cents more per card, which can really add up if you make and send a number of cards! So, I've been experimenting with embellishments on my cards that create dimension without creating lumps. 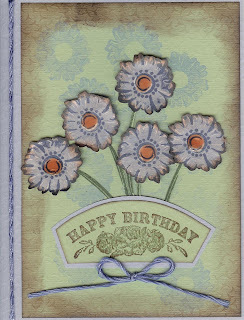 Using Close to My Heart stamps, I made the flowers and cut them out, adding dimension by crinkling the edges. The centers are made with Sepia Accents by Ranger Ink, adding visual interest without the thickness of brads, which are my preferred way to add centers to flowers. If I send this card in the mail, I will lay a piece of thin bubble wrap over the front--it protects the embellishments and adds thickness, but more like a thick letter than an embellished card. 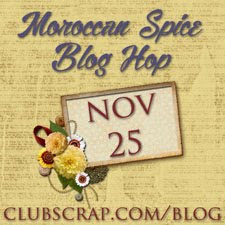 Mmmm...and I just realized that the card matches the colors of my blog! Now you know what my favorite colors are!